Model car on a 1:43 scale, made using injection die casting process. Collector quality. Essential for children's' bedrooms. The Little ADAM is for little ones aged between one and four. 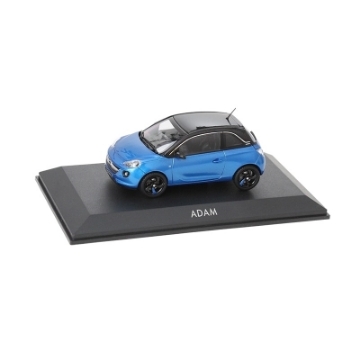 Consisting of a solid blow-moulded plastic body in the current ADAM design, includes horn and ADAM boomerang design rims. Another highlight is the towing hitch which can be used in new and creative ways. High-quality clear glass headlights and rear lights in 3D effect make the genuine design perfect. Collector's model on a 1:55 scale. Each in a transparent PVC box.